Fighting…it isn’t cool anymore. It won’t change the game, but maybe hockey fans need to change their perception of fighting. Very few hockey players earn the position of Enforcer. The tragic deaths of Rick Rypien, Wade Belak and Derek Boogaard have raised serious questions on depression, drug abuse and violence. The focus needs to be on the individual certainly, but as a hockey culture the promotion of violence sells. Columbus defender James Wisniewski has been suspended four times since March 2008. He’s a repeat offender because his job description implies this. The regular season hasn’t started, yet Wisniewski will sit out the rest of the preseason and eight regular-season games for his hit to the head of Minnesota Wild forward Cal Clutterbuck. Clearly, James needs a performance review. His job is defender not retaliator. But how far apart are those two skills really? The Enforcers are the emotion of the team, raw emotion. These guys didn’t have character flaws as most read in tributes for Rypien, Boogaard and Belak. Their roles were to carry and defend the burden of the team’s angst. Being a defender isn’t being the emotional misfit of the team who can’t cope, rather they are the guys who go out every night watching the other guy’s back. Rypien, Belak and Boogaard were the “burito” on the team. Teaching in urban Denver, I befriended many gang members who sat in my classes. These were not stupid guys, rather appeased at what their role was in society. “Burito” is the man in the gang who cleans up and does the dirty work, always involving someone who crossed the gang or a gang member’s family. That’s a “team” in North Denver who face poverty, murder and gun violence. What about the team at the Pepsi Center? Cody McLeod is the goon for the Avs, and if you’ve ever seen him smile you’d doubt he’d pop a fist at all. The Colorado Avalanche are in no danger on the ice with poverty, murder or guns. Let Cody play his game, if he has one. Enforcers have a tough time breaking out of that role partly because their other skills on the ice don’t ring to the same tune as a Pavel Datsyuk or a Ryan Kesler. Both Kesler and Datsyuk have thrown down despite their excellent puck skills. Once the fighting is gone, then the NHL will be healed, right? Apparently, not so. Preseason hockey has left a few tough guys out of the first week of regular play via suspension for blindside hits. It all evolves from the same defensive job. There are always the guys who have to do the dirty work. Belak said he was okay being the fighter because that was his place on the team. How many men and women in the military prefer the raw combat? Tough as nails ones do. How many cops are eager to patrol the beat in Bayonne? If it’s a spot on the force, then they do it willingly knowing it will harden them. Rookies in the NHL do not succumbed to the enforcement pact. Only experienced goons take the slugs. Rookies make hits, which leads to more hits. Police, soldiers, and hockey players all play an emotional game. Each career choice asks them to hand over their heart and dedicate it for the team. The NHL needs to protect the Enforcers to save their lives, is the nature of this beast. Bear hugging has been the alternate for hits and to a brawl taking the NHL from pissed to polite. Good sportsmanship never gets old. The NHL wants to monitor the physical and mental health of its employees; other companies could benefit from joining this bandwagon. Corporate values have always been about the money, and if you don’t think the NHL is a corporation then you haven’t heard: our society has moved to care about money, not people. In today’s workplace you are replaceable if you are mentally or physically not tough enough, so goes it on the ice. It wasn’t Newark or Hoboken, but it was the home of the Albany Devils, the AHL affiliate of the New Jersey Devils, where the win over the New York Rangers revitalized a new Devils era in the Garden State. The future is looking bright for the New Jersey Devils as they beat the New York Rangers, 2-1, in preasesaon action. For the first time since 1996, the Devils, who have won three Stanley Cup titles since 1995, did not make the postseason last year. This year the chances of a preseason playoff berth is clearly up for grabs. Petr Sykora, a Stanley Cup winner for the Devils in 2000, scored the first goal in the Devils-Rangers preseason opener. Sykora, who hasn’t played in the NHL since the 2009-10 season, was invited to Devils training camp. New head coach DeBoer’s style was introduced during training camp and encouraged more open ice skating. DeBoer, previously the coach of the Florida Panthers from 2008-2011, led the Panthers to a 30-40-12 record and was dismissed at the end of the season. 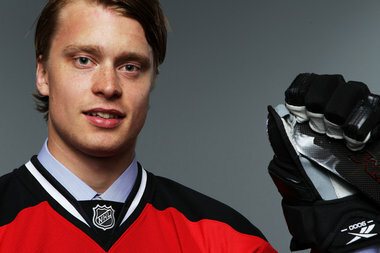 Rookie Adam Larsson has become the new defensive hope of the New Jersey Devils. The 18-year old rookie will have some veteran defenseman assiting in what should make for an intersting year. Returing veteran defenders include: Henrik Tallinder (16 points, minus-6), Anton Volchenkov (125 hits in 57 games) and Bryce Salvador, who missed the 2010-11 season with an inner ear ailment. Placing Ilya Kovalchuk, Zach Parise, and Patrick Elias up front gives the Devils a front line to be reckoned with if the thin blue line can hold the army back. Travis Zajac is predicted to make a mid-season return. And if Andy Larsson does play in Jersey this season, he’ll give Parise a break from the matinee idol hysteria.